The organisation of Petroleum Exporting Countries (OPEC) just hiked their 2010 oil demand growth forecast by about 13%, due to stronger than expected demand from developing nations (‘non-OECD’ nations). 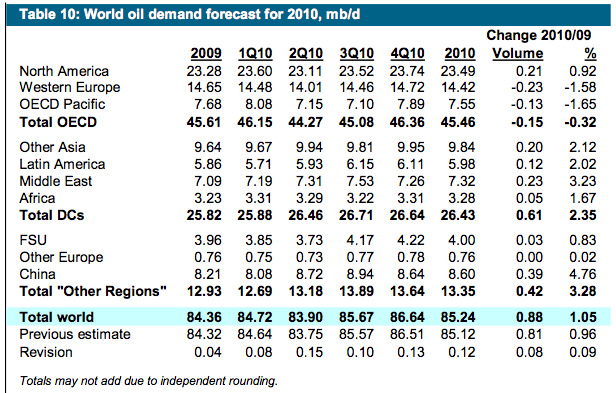 World oil demand is expected to grow by 0.9 mb/d in 2010, following a contraction of 1.4 mb/d in the previous year. This represents an upward revision of 0.1 mb/d from the previous assessment. 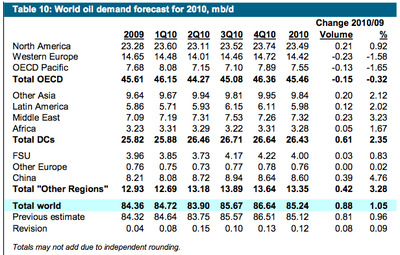 Oil demand has been highly dependent upon the pace of the global economic recovery. OECD demand is still expected to remain at negative growth around 0.15 mb/d, while non-OECD demand is projected to grow by 1.0 mb/d, driven by China and the Middle East region. However, despite this relative improvement, the projected demand for OPEC crude is still much less than current OPEC production by around 1.5 mb/d. If only part of this surplus were translated into OECD commercial inventories, this would result in further stock build, adding to the already inflated levels of more than 90 mb above the five-year average. Indeed, OECD stocks have already showed a contra-seasonal build in January, driven by both crude and products. Always keep the above fact in mind. Oil prices are high simply due to market manipulation via the OPEC cartel. If oil had a free market, supply would massively outstrip demand.